Great article that reveals all the possibilities when a transit project is done right. The key element in any major premium transit project is permanence. The economic, social, and environmental co-benefits illustrated through short visual bites in the linked article are only realized when the community has confidence its not going away. Rail is best suited for this kind of commitment but BRT and Rapid Bus systems can demonstrate permanence with investments in high quality fixed supporting infrastructure like functional stations at destinations along the way and at both ends, dedicated guideways, transit pass kiosks and more. Successful transit is close to home, frequent, reliable, and not only gets me where the action is but stimulates action near by. It doesn’t necessarily matter what kind of wheels it has. 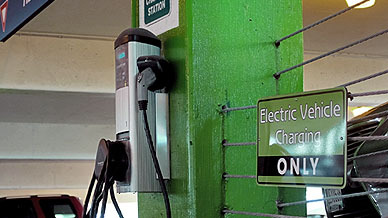 A reserved electric car charging station in St. Paul parking garage.